COLUMBIANA – Carolyn Ross Beck, 88, passed away Saturday morning, August 4 at Assumption Village. Mrs. Beck was born on March 25, 1930 in Orrville, OH, the daughter of Henry and Naomi Ross. She moved from Orrville to Salem in 1945 and graduated from Salem High School in 1948. She entered the Hannah Mullins School of Nursing in Salem and received her RN degree in 1951; over the years she worked at Salem City Hospital and Parkside Health Care. Carolyn also worked with her husband for 35 years at their home business, Beck’s Home Decorating Center. She was a dedicated member of Columbiana First Christian Church, where she was baptized on March 25, 1952. Her biggest past time was spent in service at the church, where she was a member of the U & I Class since 1951. Carolyn coordinated and was a teacher in the children’s and youth programs, established the Happy Day Express and was a member of the Priscilla Circle. 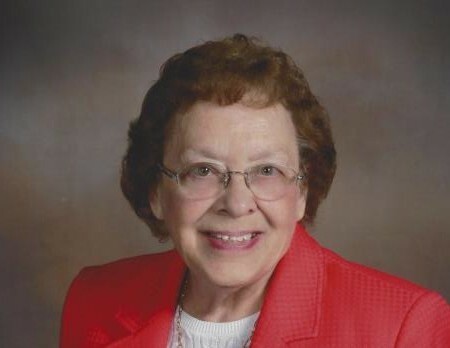 She was on the local board of the Chamber of Commerce for two years and was co-coordinator and member of the Community Christian Women for over 43 years. Carolyn leaves to cherish her precious memory one son Ken Beck and his wife Mary Lou of Grayson, KY; three daughters, Margie Redford and her husband Doug of Cincinnati, Marcy Patton and her husband Dave of Columbiana, and Karen Ullom and her husband Steve of Columbiana; 9 grandchildren and 13 great-grandchildren. She was preceded in death by her parents, her husband Richard Beck whom she married August 11, 1951 and who passed away January 20, 2012 and brother Robert Rex Ross. Funeral services will be held on Tuesday, August 7 at 11:30 a.m. at First Christian Church, 39 Cherry St., Columbiana with Minister John Reed officiating. The family will receive friends two hours prior to the service, from 9:30 to 11:30 at the church. Interment will follow at Columbiana Cemetery. In lieu of flowers, the family suggests donations may be made in Carolyn’s memory to First Christian Church.